Last week I spent a few days in Toronto visiting my sister, and it was so great to be back. I love being at the cottage, but I’m a city girl at heart (we move back to Toronto for good in less than 2 weeks!) Don’t get me wrong, the cottage is beautiful & peaceful, but it can be a little isolating during the week. I took the train into the city, and wanted to pack myself a healthy snack. 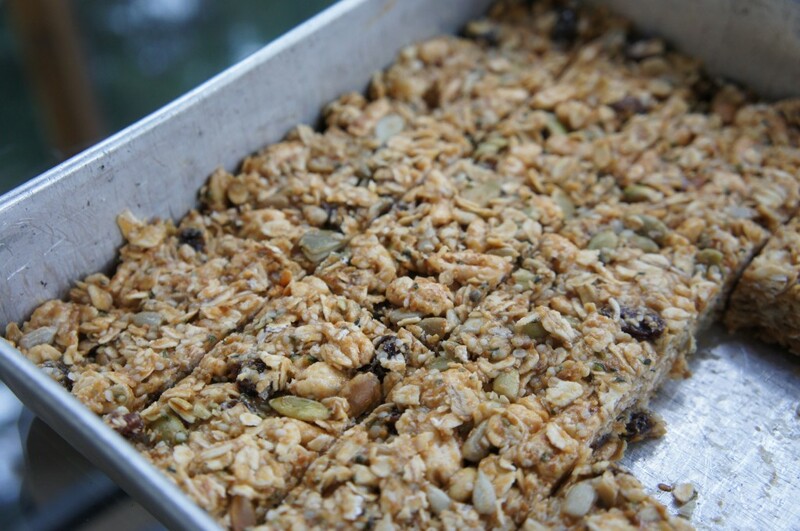 I’ve been trying to perfect a recipe for healthy granola bars, and I think I’ve finally done it. I love granola bars, but most packaged options are too high in sugar and contain refined soy products & preservatives (yuck). 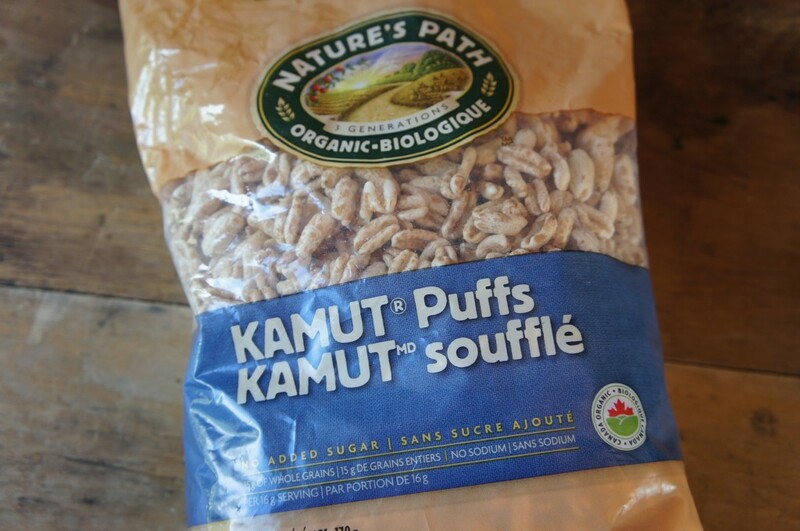 I developed a no-bake recipe that includes kamut puff cereal (pictured above) that I found in the health/organic section at Loblaws (they were only $2.50!). Khorasan wheat or kamut is a whole grain that has a higher protein content than most grains and is a source of zinc, magnesium & selenium (an antioxidant!). And although it contains gluten, it’s more easily tolerated by those with a gluten sensitivity. You can get kamut cereal, flour (to make bread, waffles or pancakes) or flakes (look similar to oatmeal, but have a nutty flavor & more protein!). The next time you’re planning to travel, and want a healthy snack, give this recipe a try – it’s high in protein, whole grains & healthy fats – they will keep you satisfied on your journey, and they’re delish! 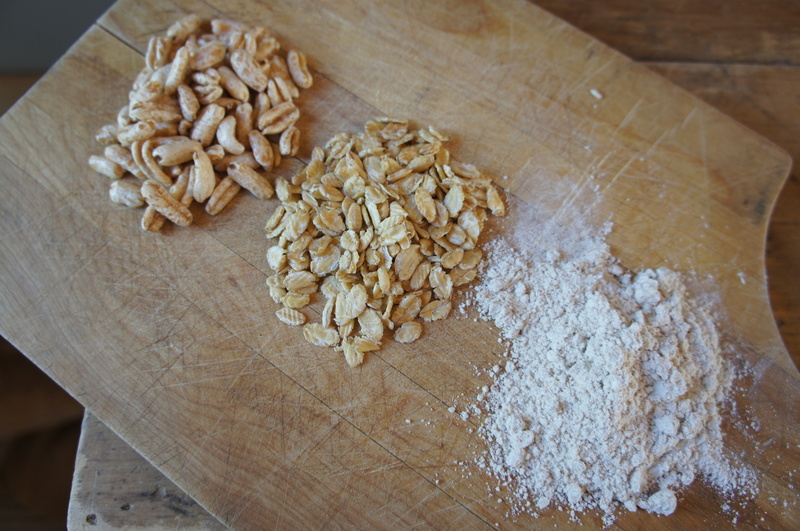 Add the wet ingredients to the dry ingredients and mix well until all the ingredients are evenly distributed. Spread mixture into a pyrex or square baking pan and refrigerate for 30-60 minutes (this will firm up the mixture & make them easier to cut). Cut into bars (like you would rice crispy squares! ), wrap individually & store in a sealed container in the fridge (you can also freeze them to make them last longer). These look delicious! How many calories per bar? 180 cals per bar! You can also use real maple syrup instead of honey! As soon as I saw this recipe, the ingredients were bought and the mixture just went into the fridge! 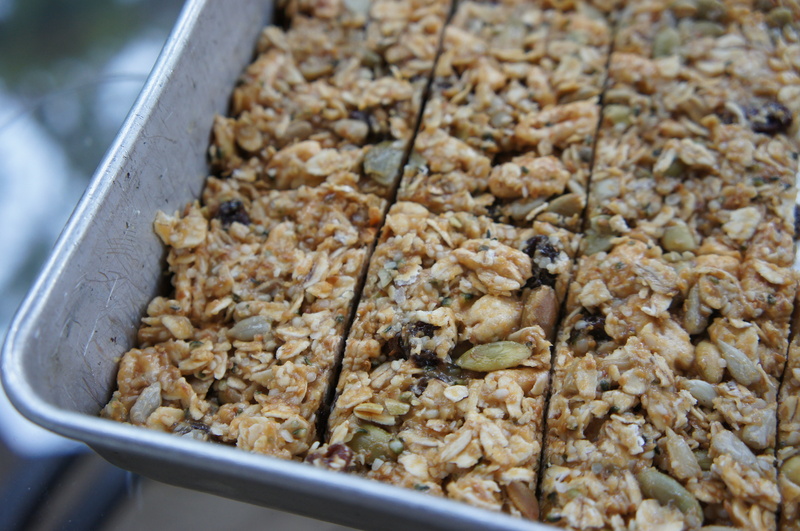 So excited to have an easy healthy granola bar! They will be perfect for long days at the store!! Thanks so much for posting Lauren!!! I love this easy recipe. Can you recommend something to replace the peanut butter/almond butter since my kids can’t take nuts to school? Thanks! Thanks Brenda! Great question. You can definitely substitute almond/peanut butter for sunflower seed butter or pumpkin seed butter. 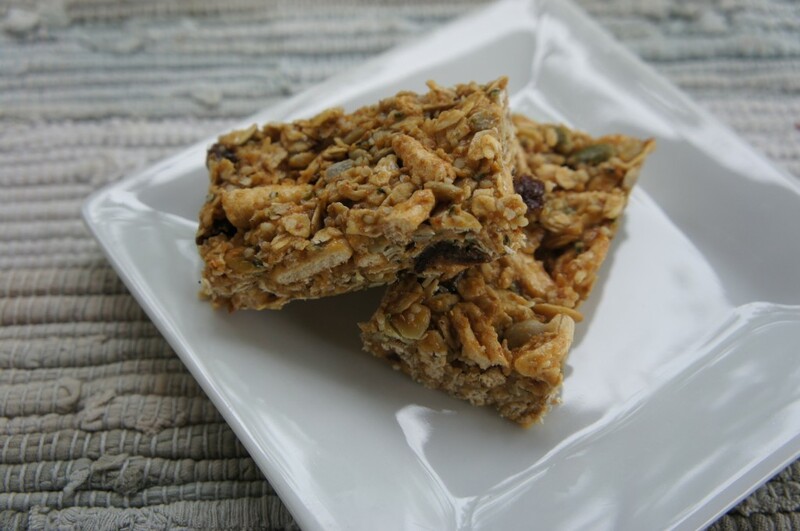 Either would work, and both are great sources of omega-3 fatty acids, which is so important for a healthy brain – these granola bars will keep your little ones’ brains sharp in school! Thanks, Lauren. I will try one of those alternatives.